November and December are the months when people head to Goa. You can wrap up the year with a super fun New Year’s Eve party at Anjuna Beach. Party till the wee hours of the morning right under the stars and relax at one of the beach-facing shacks when your feet are too weary from all the partying. Shiva Valley and Curlies are known to throw some of the best new year parties that you’ll ever be part of. After all, the nightlife in Goa is the most sought-after experience. Another Goan tradition that you can’t miss is that of burning the dummy of an old man dressed in old tattered clothes in a way to symbolize the burning away of all the worries, mishaps and problems, only to bring in the new year, afresh. Shopping is therapeutic and what’s better than shopping under a sky full of stars? Head to Arpora and get your hands on some of the best collections of clothes, funky jewelry and fancy home decor items. The market is open from April to November and is open for shoppers only on Saturdays from 6 pm to early Sunday morning. What’s better than midnight shopping on a Saturday night? If you’re a water baby, Dona Paula is the place for you. Get your swimming gear on and jump into the water sports that are supervised by well-trained professionals and overlooked by guards at Dona Paula Bay. You can choose from scuba diving, dinghy sailing, banana boat riding, parasailing among many other water sports options. Make sure you book these experiences well in advance so you don’t end up being disappointed in case they are overbooked during season time (November-December). Dona Paula will also remind you of some of the Bollywood movies you’ve watched as the place is a very popular location for Bollywood movies, think Golmaal, Singham and the likes. Try to visit Goa in the months from October to December as the weather is really good and most of the water sports will be functional. Can’t get enough of the water? Hop on the evening cruise that starts from Panaji jetty at Mandovi River and takes you to close to the Miramar beach in the span of an hour. During your time on the cruise, you will be delighted to watch some locals perform unique Goan dances. What’s better? You can also be part of the dance sessions. The evening cruise is a good relaxing experience. Once you’re done with the water sports, set out and explore old Goa. There are some beautiful churches in Goa that you must visit. Basilica of Bom Jesus in Old Goa is one such site. UNESCO’S World Heritage Monument, Basilica of Bom Jesus is one of the oldest churches in Goa and the rustic exteriors only add to the Victorian feel of the Church. While Goa is the Indian Miami, it’s also got some Vegas-like things to do. So why not visit places that transport you to Vegas (well, almost). Few of the most popular casinos in Goa are the Deltin Royale, Deltin Jaqk and Casino Pride. To reach these casinos, you’ll have to buy tickets from the counters at Panaji jetty and then you can embark on a speedboat that takes you to the ship that hosts the Casinos. The Casino ticket is inclusive of unlimited food, beverages (alcoholic and non-alcoholic) along with some tokens for playing at the Casino. The Casinos are open to customers all day, throughout the year. Make sure you’re dressed in formals or smart casuals or they might deny you entry to the Casino. You might be surprised to know but Goa has various spice plantations that you can visit. If you’re someone who is curious or has an interest in the workings of the spice business, a spice plantation tour is the best thing to do for you in Goa. Ponda, a small place located at a distance of 25 kilometres from Panaji has the Savoi Plantations where you can see and learn about betel nut, coconut and pineapple plantations, among others. The Sahakar Spice Farm, Parvati Mandav Park Plantation and the Pascoal Spice Village are some other spice plantations that you can visit. The best part about touring these plantations is that they let you take little packets of fresh spices from the plantations once you’re done with the tour. Baga beach is one of the most popular spots for shopping in Goa. The night bazaar at Baga Beach is an absolute paradise for shoppers. 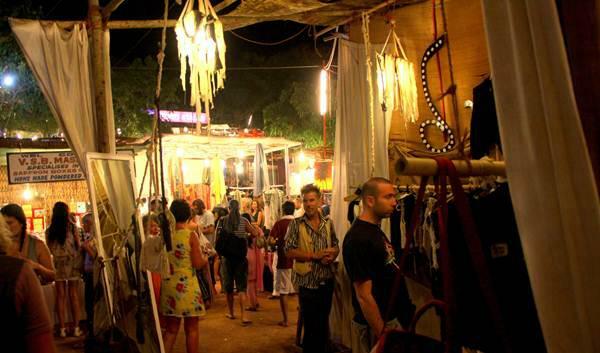 You will find everything from clothes to funky imitation jewelry at the night bazaar that takes place at Baga. Lit up with a thousand lights and soft music playing in the background, the bazaar turns into a flea market selling everything you can ever think of in just one place. After you’re done shopping, grab some yummy food at Cafe Mambo. Calangute Beach is a family beach that is the best place to go to on a lazy day in Goa. After all the sightseeing and partying in Goa, when you’re tired and want to relax, head to Calangute where you can just chill by the sea. You can lie down on the beach-beds while sipping on some Goan fenny or coconut water at one of the shacks. Close in on your Goa trip with a soothing massage at one of the spa resorts in Goa. If you’ve got a bigger budget, try the spa at Taj Fort or you could also go to the Dudhsagar Spa resort. Some hotels in Goa are specially designed to cater to your need for relaxation. These massage range from simple coconut oil massages to full-fledged Swedish or Thai body massages. Let Goa rejuvenate every nerve running through your body and soul in its own little way. Drop in your favourite thing to do in Goa, in the comments below!